How easy is it to do business in Egypt? From a total of 185 countries, Egypt is ranked 109 in ‘ease of doing business’ – but why does it deserve this rank? 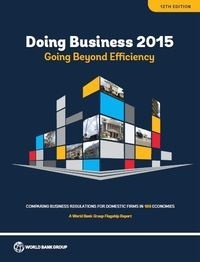 Every year, the World Bank and the International Finance Corporation release a report with the year’s most recent statistics about doing business and comparing business regulations for domestic firms in 185 countries – one of which is Egypt. The general slogan of the report this year is “Smarter Regulations for SMEs” and Egypt conquered place 109 in terms of business regulations. 1. The easiest thing for a business-owner in Egypt would be to trade across borders (rank 70): 8 documents and 12 days needed to export, $625 per container. 9 documents and 13 days needed to import, $755 per container. 2. In terms of protecting investors, Egypt occupied rank 82, as it scored a 5.3 on a scale from 0 – 10. As for the extent of the disclosure index, the country scored an 8, while the director liability index only earned 3 out of 10 and the ease of shareholder suits index got an average 5. 3. Getting credit is the next-best thing for business-owners, as Egypt was rated 6 on a scale from 0 – 6 in the depth of the credit information system, although the strength of its legal rights index only scored 3 out of 10. 4. To register one’s property, it takes 7 procedures and 72 days (rank 95). 5. Getting electricity to your facility takes 54 days, with as much as 7 procedures, placing the country on rank 99. 6. In case one’s business is involved in an insolvency that requires resolving, it would take 4.2 years, which sounds like a lot of time, but still puts Egypt on rank 139 – which means that there is worse. 7. There are 29 taxes that need to be paid per year, and it would take a business 392 annual hours of doing so, as 42.6% of the company’s profit amounts to the total tax rate required (rank 145). 8. Enforcing contracts in Egypt takes 42 procedures and 1,010 days, which equals to about 2.5 years (rank 152). 9. The hardest factor to deal with in Egypt are construction permits. Construction permits procedures amount to 22 per business, requiring 218 days, which puts Egypt on a global rank of 165. However, Egypt is considered “good” at protecting investors in reference to “requiring external review of related-party transactions”.